Motor vehicle injuries cause millions of Americans to go to the emergency department (ED) each year. The cost for each patient can add to thousands of dollars in doctor visits and many more thousands if hospitalized. Americans spend around 1 million days in the hospital every year due to motor vehicle accidents. Around $18 billion of lifetime medical costs occurred in 2012 from car accidents, and more than 75% of costs occurred within 18 months of the injury. Around 2.5 million people went to the emergency room in America due to a motor vehicle incident, and around 200,000 individuals were hospitalized after a car accident. Uphold and support traffic safety laws. Support Sobriety checkpoints and police patrol. Support car seats, booster seats and seat belts. Support reducing drinking and driving, also drugs. Support to improve teen driving safety. 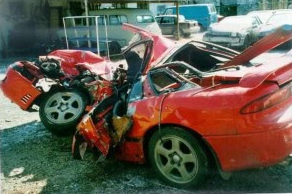 More studies about crashes and how to prevent them further. Distracted drivers. A distracted driver is a motorist that diverts his or her attention from the road, usually to talk on a cell phone, send a text message or eat food. The faster you drive, the slower your reaction time will be if you need to prevent an auto accident. Reckless driving. Reckless drivers are often impatient in traffic so be sure to take extra care around aggressive drivers. Driving drunk. When you drink, you lose the ability to focus and function properly and its very dangerous when operating a vehicle. Always use a designated driver. Running red-lights. To avoid a car accident, look both ways for oncoming cars as you approach a green light. Running red-lights can cause side-impact collisions. Water creates slick and dangerous surfaces for cars, trucks, and motorcycles and often causes automobiles to spin out of control or skid while braking. Teenage drivers. Teens often lack experience and lose control much easier in a potentially bad situation. Running Stop signs. Each year, thousands of car accidents occur because one driver ran a stop sign. Stop at every stop sign and look both ways before going. Automobile defects. Automobiles have hundreds of parts, and any of those defective parts can cause a serious car accident. Always research any recalls if buying used. Night Driving. Driving at night nearly doubles the risk of a car accident occurring. Driving the wrong way. Going the wrong way, everyone is in danger because as you head towards a car accident. Unsafe lane changes. To prevent a needless car accident, use your turn signal, check your blind spots and always proceed carefully into the next lane. You can prevent these car accidents by giving the car in front of you a one-car-length buffer for every 10 mph you drive. Don’t be impatient. Improper turning. Always look for signs, and obey the proper right-of-way before you make a turn. Drive slow on any ice, and beware of black ice, which is also called “glare ice.” This is nearly transparent ice that often looks like a harmless puddle or is overlooked entirely. Take caution at all times when weather is cold enough for ice. Driving under drug influence. If your mind isn’t clear, and you don’t have complete control over your body, getting behind the wheel can lead to serious car accidents. Snow’s dangerous mixture of ice and water is a dangerous recipe for car accidents. A trip to the ER or doctor for a motor vehicle injury will result in the doctor examining you for any physical damage. He/she will also do test for mental damage as well. One of the most common injuries is whiplash (cervical strain). Whiplash can cause serious neck ligament and muscle damage. Depending on the severity of the accident, emergency medical services may be provided. No matter how big or small the injury, all individuals who are involved in a motor vehicle accident must get their injuries treated before they develop into more serious conditions; whether they are whiplashes, strains or sprains or worse. Desert Institute for Spine Care offers quality treatment for auto accidents and accepts personal injury liens. The Gilbert pain management center has a Double Board Certified pain doctor, Ajay Yeddu MD, who accepts most insurance. Call us today!